The expenditure is for a thirty-year program to “modernize” the U.S. nuclear arsenal and production facilities. Although President Obama began his administration with a dramatic public commitment to build a nuclear weapons-free world, that commitment has long ago dwindled and died. It has been replaced by an administration plan to build a new generation of U.S. nuclear weapons and nuclear production facilities to last the nation well into the second half of the twenty-first century. This plan, which has been largely ignored by the mass media, includes redesigned nuclear warheads, as well as new nuclear bombers, submarines, land-based missiles, weapons labs, and production plants. The estimated cost? $1,000,000,000,000.00 — or, for those readers unfamiliar with such lofty figures, $1 trillion. Of course, this nuclear “modernization” plan violates the terms of the 1968 nuclear Non-Proliferation Treaty, which requires the nuclear powers to engage in nuclear disarmament. The plan is also moving forward despite the fact that the U.S. government already possesses roughly 7,000 nuclear weapons that can easily destroy the world. 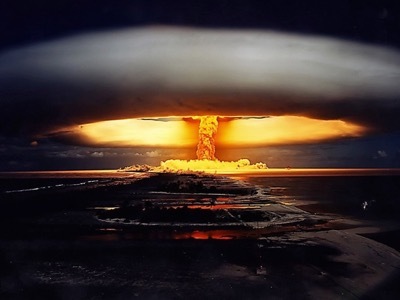 Although climate change might end up accomplishing much the same thing, a nuclear war does have the advantage of terminating life on earth more rapidly.